Africa’s mountain gorilla population has been decreasing for many years. But now, wildlife groups say their numbers are finally rising. The mountain gorillas live in protected forest areas in Rwanda, Uganda and the Democratic Republic of the Congo. But they have faced the danger of disappearing as their population steadily fell. The gorillas’ environment has been threatened by human agriculture production in surrounding areas. Other threats include illegal hunting, civil unrest and human-introduced diseases. 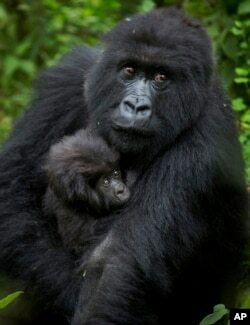 In 2008, the mountain gorilla population was estimated to be around 680. In 2018, IUCN estimates showed the number had increased to more than 1,000. IUCN officials noted the new growth was fueled by increased and improved conservation programs. Several nations had cooperated to create effective conservation efforts, the organization said in a statement. This led to “positive engagement from communities living around the mountain gorilla habitat,” the statement said. Tara Stoinski is president and chief scientist of the Dian Fossey Gorilla Fund. The not-for-profit group is based in Atlanta, Georgia. It is named after the researcher whose work helped bring international attention to mountain gorillas. The organization has been involved in conservation programs. Stoinski called the IUCN findings a great “conservation success.” In a statement, she said mountain gorillas have experienced some of the highest levels of protection of any animal in history. “This is the type of extreme conservation required if we want to ensure a future for wildlife,” she added. The conservation efforts included increased enforcement measures against illegal hunting and emergency health care for injured gorillas, the IUCN said. One not-for-profit group called Gorilla Doctors keeps medical workers in each of the countries where mountain gorillas live. They are called to treat animals with disease or carry out rescues when gorillas are caught in traps set for other animals. Bryan Lynn wrote this story for VOA Learning English, based on a report by the Associated Press and online sources. Mario Ritter was the editor.